So, I warned you it was gonna happen. We’re going back in time. So, check you have a warm jacket on, you have a few sandwiches for the journey and you have been to the toilet. Cos we won’t stop now until we go back one year. One year exactly. And what happened on this fine day in 2010? Welcome to 2010 (again. Unless you’re a newborn baby, in which you should not be time-travelling), I’ll be your guide. My name is Neil. I watched Germany’s first game in a restaurant in the East of Berlin, and after their total destruction of Australia’s ten men, had to suffer a long journey home in an U-bahn full of ecstatic Germans with Vuvuzelas. Now, after living here over a year, I have a great mistrust of happy Germans. It upsets the natural balance. And when they are paired with the Devil’s kazoo… Anyway, after enduring days of their celebrations, including the headline of ‘We will blow you away’ in the German version of the Sun (Bild), it felt that Germany had already won the World Cup. Watching them lose to Serbia in an Irish bar (which was full at kick-off, half-empty after the missed German penalty, and completely empty except for two Geordies by the final whistle) was therefore extremely satisfying. After the Serbia and Ghana games, Berlin seemed a bit more realistic about how good their team is, which made life as an Englishman in Germany’s largest city a lot more bearable. On the day of the game I woke up to the noise of Vuvuzelas and the Bild headline dismissing England’s chances (as well as my neighbour singing love songs in bad English). 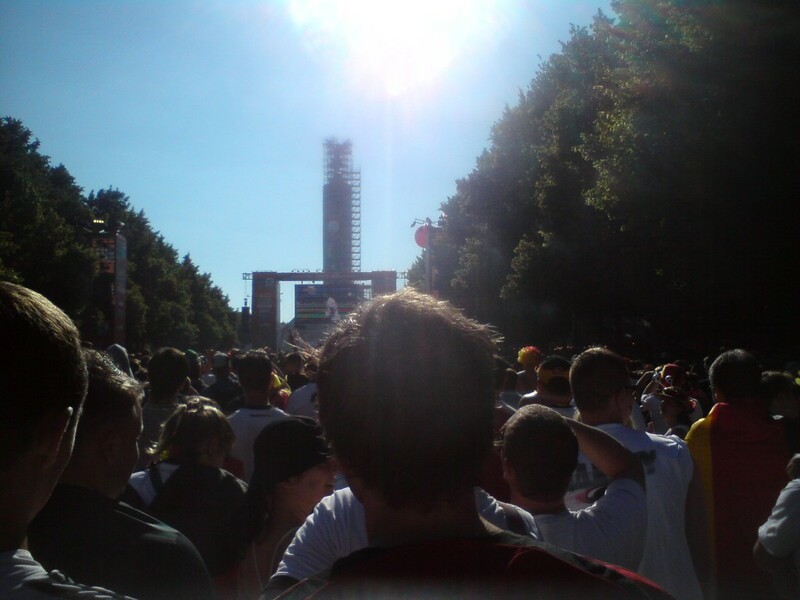 I set off to the FIFA Fan Mile in the centre of Berlin. On my journey, I was disappointed to find that their optimism, and Vuvuzelas, had returned as I meandered deep into the heart of the beast. 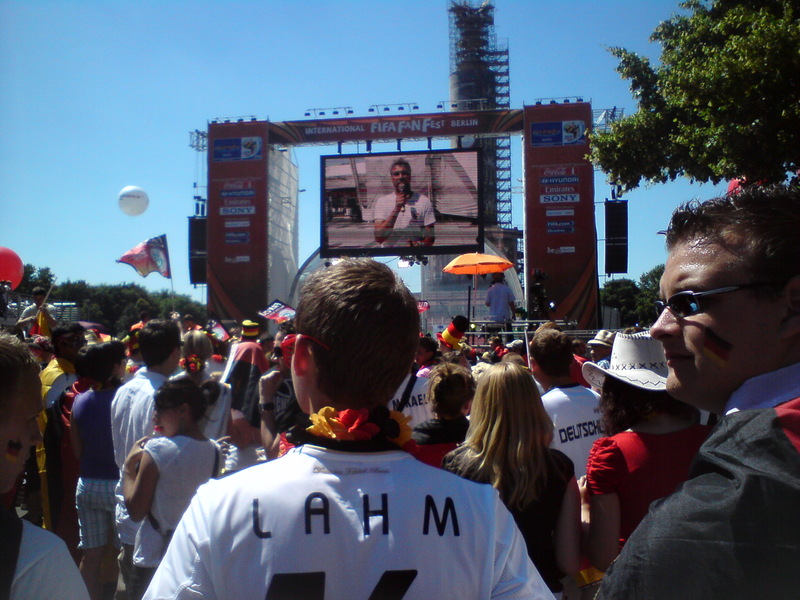 The Fan Mile, set up between the Brandenburg Gate and the (somewhat appropriately named) Victory Column, holds 500,000 people, so I arrived two hours early in the hope of getting close to the main screen (the largest of the three). Entering the Fan Mile before the game. Today. One year ago. 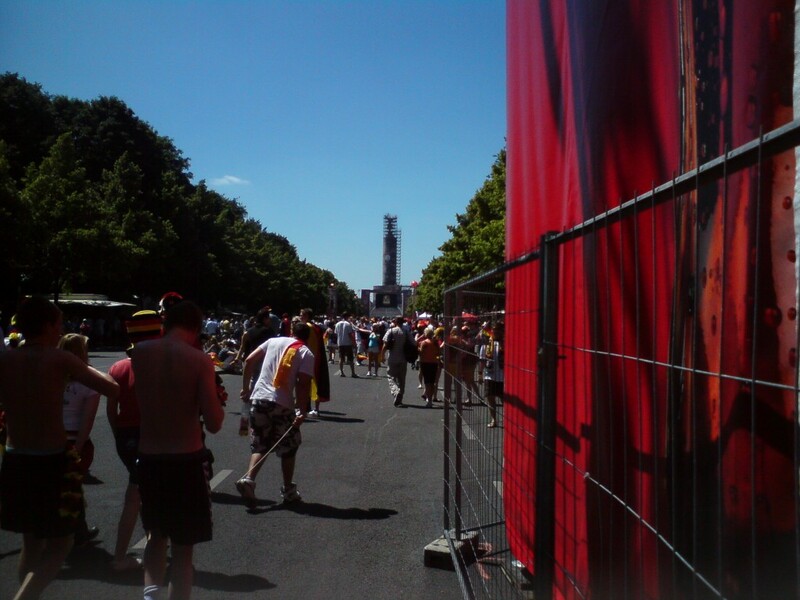 The two hours dragged in the 30 degree heat as more and more painted and flag-wielding Germans arrived at the venue. 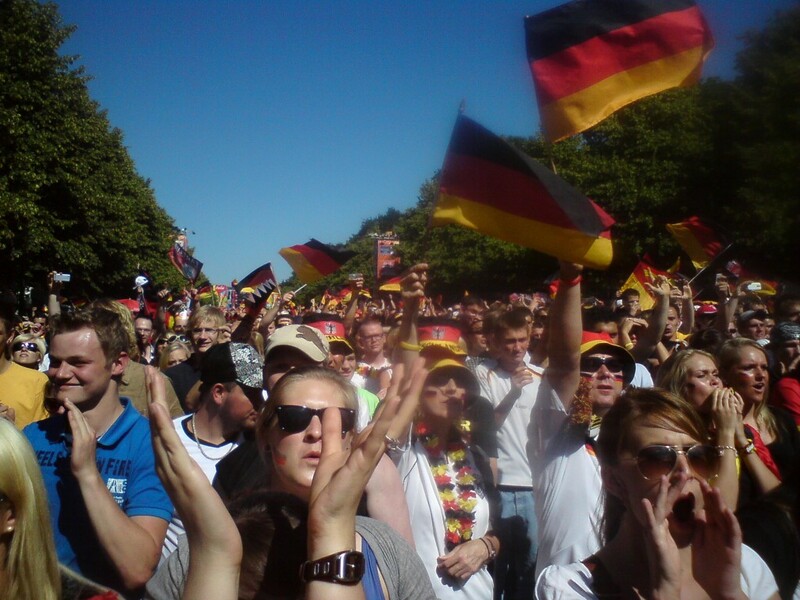 Thankfully, security removed all of the Vuvuzelas, although, unfortunately, German optimism remained. It’s quite something to be in the presence of half a million people who want your team to lose. Several ‘artists’ performed in the build up to kick-off, including Germany’s best-selling rapper Bushido, accompanied by the usual numpty with a microphone attempting to gee the crowd up, which was wholly unnecessary in the circumstances. Everyone there was pumped up to see Germany win, and needed no encouragement to voice their feelings, although special mention goes to the FIFA Wii match played on the 60m2 screen, which saw the German ‘Steven’ beat the English ‘Norbert’ 3-0. As a rational, and pessimistic, Geordie, I sensed a fix, but still every goal was still met by a deafening cheer by the vast army of Germans present. Numpty with a microphone. Today. One year ago. The cheer was not, however, as loud as the one that met Klose’s first goal. It was celebrated with a giant pogo session, which I was stuck helplessly in the middle of, aggressively pushing people away while attempting to maintain a semblance of neutrality. This proved impossible seeing how easily we were carved apart for the second goal, so I marched to the toilet, muttering a selection of the finest English swear words to myself. The chants of ‘Deutschland’ and the chorus of the White Stripes ‘Seven Nation Army’ (although without the words) quickly became ‘Germany score a goal’ and ‘England are going home.’ Hell, they were clearly delusional, I thought, as I even heard ‘Schweinsteiger is a football God’ as I shut the portakabin door. Half a million Germans enjoying the sun. Today. A year ago. Anway, I missed our ‘first’ goal as I was in the toilet (I defy anyone to spend that much time alone with half a million Germans without having several beers), but due to the muted reaction, I wasn’t sure what had happened until the replay came on the big screen. They didn’t seem to care at all about this ‘setback’, although I heard a few (albeit not many) guilty chuckles after Lampard put the ball clearly over the line (does anyone else think that sums up his English career – the one time in recent memory he does something good for his country, it doesn’t count?). At half time, I had a bit of peace and quiet to think (ignoring the text messages building up in my inbox). I ripped up my betslips… well, metaphorically – no one does that anymore do they, really? Or not many, with the rise of internet gambling. Anyway, I digress. I crushed my last plastic beer glass under my foot, resolving not to drink any more until extra time. England seemed to start the first half with a bit of purpose, and the Germans seemed a bit quiet. I was starting to enjoy the game a little more (although I tried to keep my pleasure quiet). Hell, for 20 minutes, I almost forgot where I was watching it… Mueller’s first, however, reminded Berlin (and me) which team had been superior for the clear majority of the game. When he fired his second just three minutes later I was so disgusted I wanted to leave, but my ‘journalistic integrity’ made me stay until the end (on your behalf, dear reader), deflecting flying pogo groups and being hit from all angles by beer showers. 'Golden Generation' my arse. Today. One year ago. This entry was posted in Football and tagged Berlin, Berlin Fan Mile, England, Germany, Time Travel, Today, World Cup 2010. Bookmark the permalink. Pretty much summed it up in a nutshell mate. Assume the time machine was based on the same “Hot Tub” model as used in certain films? Germany and Spain are looking strong for the next few years, but the fact it’s in South America will have an impact. I hate the whole “Brazil will win because it’s in Brazil” approach to logic but it will be a factor of sorts for sides used to playing in such climes – Argentina, Uruguay, Mexico etc. Not really a ‘hot tub’, but its invention did involve experimenting while appropriately dressed for a bath. I think the heat won’t affect Germany and Spain too much, but probably will a lot of the other teams. Cheers for that link – was a canny read. You try The Blizzard?